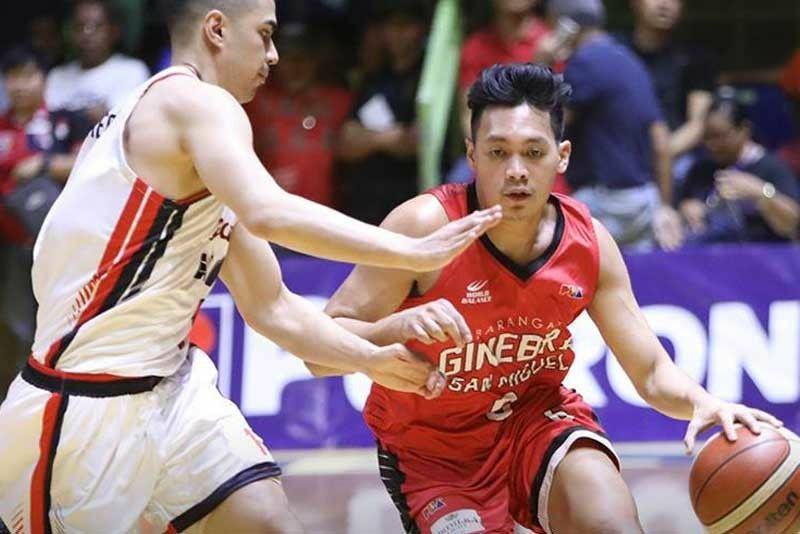 MANILA, Philippines — Japeth Aguilar and Scottie Thompson showed their readiness to once again do duty to the national team, churning out solid effort to lead Barangay Ginebra to an 85-67 rout of Blackwater in their PBA Philippine Cup Petron Blaze road showdown at the Davao del Sur Coliseum in Digos City last night. Aguilar, back from an ankle sprain suffered in their last outing, collected 20 points, nine rebounds, three steals and one assist while Thompson piled up 16 markers, 11 boards, six dish-offs and two steals as the Gin Kings built momentum ahead of the PBA break in connection with the last FIBA WC qualifier window. Greg Slaughter contributed 17 points while Kevin Ferrer chipped in 14 markers as the Kings scored a second straight win and thus moved up to third place with a 3-2 behind Phoenix Pulse (5-0) and Rain or Shine (5-1). Meanwhile, Phoenix and ROS clash in a duel of tournament leaders while San Miguel Beer and Magnolia slug it out in a faceoff between two champion teams in an explosive twin-bill at the resumption of play at the Smart Araneta Coliseum tonight. The Fuel Masters stake their clean slate versus the E-Painters at 4:30 p.m. then the Beermen and the Hotshots square off at 6:45 p.m. in a clash pitting the reigning all-Filipino titlists and the losing Philippine Cup finalists last season that later on ruled the Governors Cup. The Beermen have just checked a two-game slump with a 93-79 win over the Blackwater Elite while the Hotshots hope to get into the win-column after dropping their season debut against the TNT KaTropa, 75-80. Ginebra 85 – Aguilar 20, Slaughter 17, Thompson 16, Ferrer 14, Dela Cruz 5, Mercado 4, Caperal 3, Cruz 3, Chan 2, Mariano 1, Tenorio 0, R. Aguilar 0, Devance 0, Teodoro 0. Blackwater 67 – Digregorio 14, Eriobu 14, Tratter 13, Desiderio 7, Palma 6, Sumang 4, Belo 3, Alolino 2, Sena 2, Jose 2, Cortez 0, Dario 0, Maliksi 0.